COSSA submitted its annual Outside Witness Testimony to the House and Senate Appropriations Subcommittees on Labor, Health and Human Services, Education, and Related Agencies. COSSA’s testimony for fiscal year (FY) 2017 addresses the need for strong funding of the National Institutes of Health, Centers for Disease Control and Prevention, National Center for Health Statistics, Agency for Healthcare Research and Quality, Institute for Education Sciences, and Title VI and Fulbright-Hays programs. Click here to read testimony submitted to the House, and here for the Senate. The U.S. Department of Agriculture’s (USDA) National Agricultural Statistics Service (NASS) has begun data collection for its first-ever Local Food Marketing Practices Survey, which will produce official benchmark data on the U.S. local food sector. According to a NASS press release, the survey will produce information on “the value of food sales by marketing channel (i.e. farmers markets, community supported agriculture (CSA) arrangements, restaurants, roadside stands, food hubs, and more), value of crop and livestock sales, marketing practices, expenses, Federal farm program participation, and more.” NASS expects to release the data in December 2016. The National Science Foundation (NSF) has issued its annual call for recommendations for membership to its various advisory committees and technical boards. These committees advise NSF’s offices and directorates on program management, research direction, and policies impacting the agency. Committees of particular interest to the COSSA community include the Advisory Committee for Social, Behavioral and Economic Sciences and the Advisory Committee for Education and Human Resources. Recommendations for membership are maintained for 12 months. See the Federal Register notice for details on how to submit names. The U.S. Preventive Services Task Force (USPSTF) is an independent advisory body that makes evidence-based recommendations about the effectiveness of clinical preventive services and health promotion. The Agency for Healthcare Research and Quality (AHRQ), which supports the work of the USPSTF, is accepting nominations for candidates to serve on the Task Force. In addition to expertise in evaluation of research, preventive medicine, and implementation of recommendations, candidates are sought with experience in public health, health equity and health disparities, application of science to health policy, behavioral medicine, and communication of scientific findings to multiple audiences. Applications are due by May 15, 2016. More information is available in the Federal Register notice. The Environmental Protection Agency (EPA) is accepting nominations for candidates to serve on two scientific advisory bodies: the Clean Air Scientific Advisory Committee (CASAC) and the EPA Science Advisory Board (SAB). More information on the jurisdiction of the committees and how to submit nominations is available in the Federal Register notice. Nominations are due on May 6, 2016. 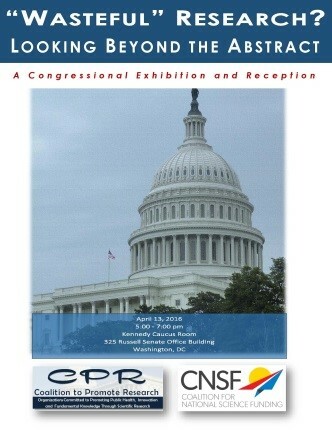 On April 13, the COSSA-led Coalition to Promote Research (CPR) and the Coalition for National Science Funding (CNSF) sponsored a Congressional exhibition and reception, “Wasteful” Research? Looking Beyond the Abstract, designed to provide researchers whose work had been targeted in the various Congressional “wastebook” publications an opportunity to put their research into context for Members of Congress and their staff. The unique Congressional exhibition and reception featured nine researchers from across the disciplinary spectrum. Also presented were posters on the peer/merit review process by National Institutes of Health (NIH) and the National Science Foundation (NSF). More than a dozen markups and hearings are scheduled this week for House and Senate Appropriations committees and subcommittees. Appropriators are moving ahead with writing their respective fiscal year (FY) 2017 appropriations bills, despite no agreement on top-line funding levels by way of a budget resolution. You will recall that a bipartisan budget deal was struck back in October, which provided for an extra $30 billion (of a $1.1 trillion total federal budget) in discretionary spending—split evenly between defense and nondefense—in FY 2017. However, the most conservative wing of the GOP in the House are digging in their heels, demanding that total funding next year not exceed the caps set in the 2011 budget agreement. Specifically, they want $30 billion cut from the October deal, taking all of it from the nondefense side where funding for federal research agencies lives. With no end in sight for the debate around top-line spending, House Appropriations Subcommittees have begun pressing forward, writing and marking up their bills consistent with the higher levels agreed to in the fall. Any effort to enact a budget resolution in the Senate has been all but abandoned. In fact, the Senate is bringing its first FY 2017 appropriations bill, Energy and Water, to the floor this week, setting a record for the earliest Senate floor vote. The House traditionally moves before the Senate on spending bills, but, this year, the House does not intend to get its first bill to the floor for at least another month. The full House Appropriation Committee will mark up the Agriculture Appropriations Bill on April 19 (see related article), which includes funding for research and statistical agencies of interest to the COSSA community. In addition, the Commerce, Justice, Science (CJS) Appropriations Bill, which funds the National Science Foundation, National Institute of Justice, Census Bureau, and other relevant agencies, will be marked up by the Senate CJS Subcommittee on April 19 and the full Appropriations Committee on April 21; stay tuned for COSSA’s full analysis. It remains to be seen whether promises to move all 12 appropriations bills through the House Appropriations Committee by the end of June will stick or what the Senate’s quick start means for some of the more controversial bills later in the queue. Election year politics always throw a wrench or two into what is already a challenging environment for deal-making.